Whether or not you actually have any Harvest to profit of - whether you grow your own vegetables or you just buy them when needed - if you want to make most of it, your Autumnal activities in the Kitchen will probably be centered around making preserves. Most of us probably have some memories of our Grandmothers or Mothers, somehow filling all sorts of second-hand jars with all sorts of things: jams, marmalades, pears in syrup, dill pickles, bell peppers in vinegar and any other thing they could think of. This was not because they were bored, this was because they knew that, soon, fresh produce would be unavailable and they wanted to make sure their families had something to eat regardless. Home-made preserves are a vast subject that is deceptively complicated: the absolute basics can be grasped in minutes, but perfecting your products can take a lifetime, which is why Grandmas have +50 to Craft (Delicious Things in Jars). But don't be intimidated, because even the most experienced Kitchen Witch had to start at some point, and I'm going to help you with that. 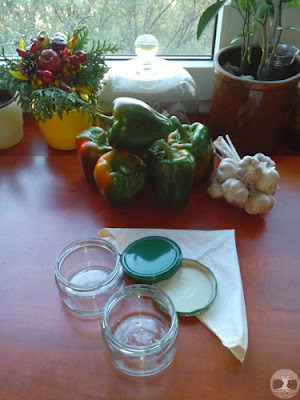 No matter what are You planning to do, practically every kind of home-made preserve will need to be put in a jar. There are all sorts of clever plastic containers available, but if you want your jams or tomatoes to keep till winter, you will need glass jars, and that is because glass jars can be pasteurised. 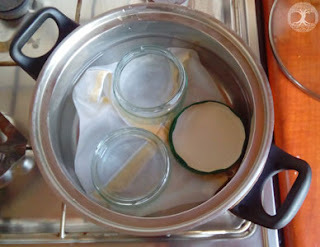 The word "preserve" is used because the food is being preserved, and the method that is feasible in any kitchen is pasteurisation, which means basically, boiling the contents when already in the jar. However, jars need to be sterilised first, and the great thing about this is that the two processes are practically the same, so you don't have to think about it too much. We will begin, then, with the home method of sterilising your glass jars so they are ready for whatever preserve you're making. Wash the jars and the lids thoroughly. Any kind of residue will start spoiling at some point and ruin the preserve. Put the clean cloth at the bottom of the pot - it will prevent the jars from rocking too violently and smashing against the bottom of the pot. Put as many of the open jars in the pot as you can fit, but remember that you need to take them out again, and if they get stuck because there's not enough room, well, you're in trouble again. Add all the needed jar lids in as well. Pour clean water into the pot. It doesn't have to cover the whole jars - actually, about one third of the jar height is enough. If you have short jars, like the ones I've used, you can cover them all, but it's not mandatory. What is mandatory is that there is water inside the jars as well as out, and that it's at the same level. Otherwise the jars can break as the temperature gets uneven. Put the covered pot over a moderate fire and wait for the water to boil. Reduce the heat so that the water boils, but boils gently, not rocking the jars too much. Boil the jars for at least half an hour. When you've had them boiling long enough, use a clean fork or ladle or something like that to take the jars out onto a clean surface. Immediately put your preserve into the still hot jars ; don't let them cool off, if you have a lot of them, take them out in parts. If any bits of food are smeared over the edges, wipe them clean with a tissue paper or something equally clean. Take the lids out of the pot one by one and screw them onto the jars. Congratulations! You've just sterilised your jars at home and your produce is ready to be pasteurised.